He tells stories. He does it while painting some historical figures from Catalonia in Ciutadella Park, Barcelona. And also while drinking a coffee, greeting people or socialising with other artists. Jorge Rodriguez-Gerada (Santa Clara, Cuba, 1966) cannot help it: this street artist from New York has grown up addicted to the storytelling narrative as much as to the brush (or in his case, charcoal). He’s a seeker, but not for riches as he distrusts capitalist society, but for the stories that lie behind every image and every face he paints. “The only thing that will save us from destruction is empathy and concern for others. The market does not believe at all in the importance of every life, it teaches you not to look at others and be indifferent”. So since the nineties Jorge Rodriguez-Gerada has done the opposite of marketing: instead of using a celebrity face like a model or a politician, he portrays anonymous people. “The biggest mistake of contemporary society is its obsession with figures: 20,000 dead, 100,000 million or two … the media transforms death into an abstract concept. If you go deep into every life that is lost, every story will surprise you and would impact upon you rather than leave you indifferent”. He has been working for more than twenty years on the street. 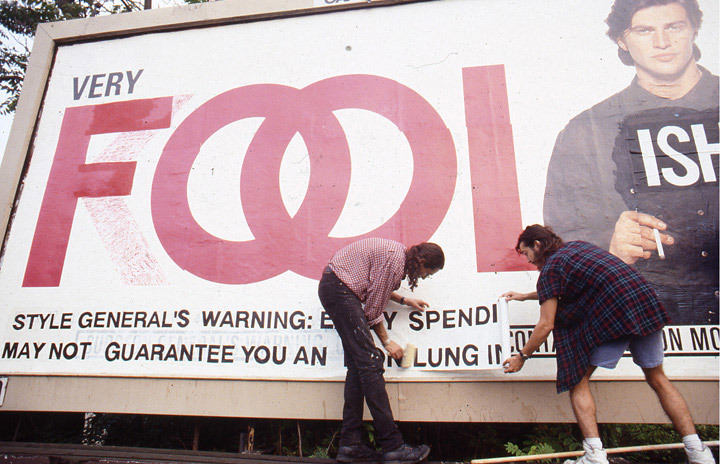 At first he changed the meaning of ads on advertising billboards to criticise consumer society and its monopoly of public space. “I started watching what images were on the streets of New York: advertising for harmful products like alcohol or poor quality cigarettes used only in poor or minority neighbourhoods. We modified hundreds of posters to open a dialogue on the visual manipulation of the capitalist system and the semiotics of the city. Without dialogue advertising monopolises all urban spaces. So we wanted to highlight the real effect of the marketed products and show the political ideology that drove them”. Deconstructing an image and analysing it critically to modify its meaning became the touch stone of a movement called “Culture Jamming”, which Jorge Rodriguez-Gerada was a founder member, and whose motivations were compiled in Naomi Klein’s anti globalisation book “No Logo”. Nowadays, behind the photorealistic anonymous portraits, social criticism is just as prevalent as before. You just have to go a step beyond and trick the limits of the visual, to look for the narrative. If marketing uses the human face for commercial purposes, Jorge Rodriguez-Gerada uses critisism; if advertising immortalises your icons, Jorge Rodriguez-Gerada offers us an ephemeral life. All their faces are destined to disappear “so that we can reflect on the importance of the here and now. If we do not work now in coexistence, for example, this will also disappear”. So he paints with materials that fade such as “charcoals, a watercolour wash and some spray for the darker parts”. He also has a liking for party walls and walls with damage. There his passion to tell human stories matches his desire to create temporary works. “I love the actual texture of the layers of an old building: not to modify the colours of the wall but to enhance the aesthetics of the families who lived there, imagining the moment that they chose this specific colour for the baby’s room, the kitchen … with charcoal you get respect for what someone else “has painted and keep its history alive”. Jorge Rodriguez-Gerada’s portraits don’t just have physical layers but also conceptual ones. 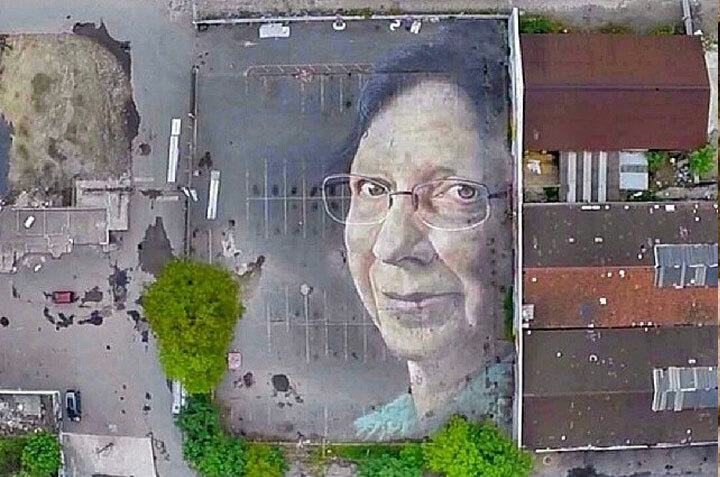 Just as with the “Wish” project in which Jorge Rodriguez-Gerada used the face of a girl from Belfast in such a large scale that you could see from a satellite. “I was walking down Belfast and I saw this little girl playing. She was so happy, you could tell she had the love of his parents. They allowed me to take a picture at the moment that she expressed a wish. At this age a wish is magical: you believe in Santa Claus, fairies … “. The intention was to use the magic that was in the eyes of the girl internationally to remind adults that “we should all try that little bit longer to maintain with this feeling of magic. But, how many things are happening in the world that will impact future generations? How much lack of vision do we have not to change those destructive aspects in society such as consumerism and pollution? Using Belfast as a basis, which is now experiencing the longest period of peace in it’s history, I wanted us to think in this future”. Jorge Rodriguez-Gerada shows a lot of enthusiasm for the overall success of street art: a movement that manifested organically and that the business market is not controlling. “It’s the purest form of artistic freedom, born from those who had no power in society, but enough money to buy a can of spray”. There’s no doubt there are also those who use street art visibility for personal marketing campaigns and accelerate their entry into the art market, but this is part of street art as it is the most realistic form of contemporary art, consisting of “an immense range where anything goes”. Art that is purely aesthetic, social, cute … “There are artists that don’t have much talent, but have a lot of passion. The truth is that there have never been so many artists and such an explosion of creativity in the world. Some companies have understood the potential of the movement and are accepting street art as part of their reality in society. You cannot say the same for Barcelona. ​​Rodriguez-Gerada came to Barcelona in 2002 during “the golden age” of street art and lived there for ten years with his family. Today he looks with disappointment upon Barcelona’s urban spaces since the government civil disobedience law changes in 2006. “Councils were afraid that if they were not very strict enough they would lose control, like in the neighbourhood of Poble Nou. But they didn’t try to enter into a dialogue with the movement, they destroyed it”. Jorge Rodriguez-Gerada stresses that “in England or Paris, the muralists could be counted on the fingers of one hand. Spain, on the contrary, is the highlight of the European murals. It couldn’t be that the most important cities in the country does not take this into account”. 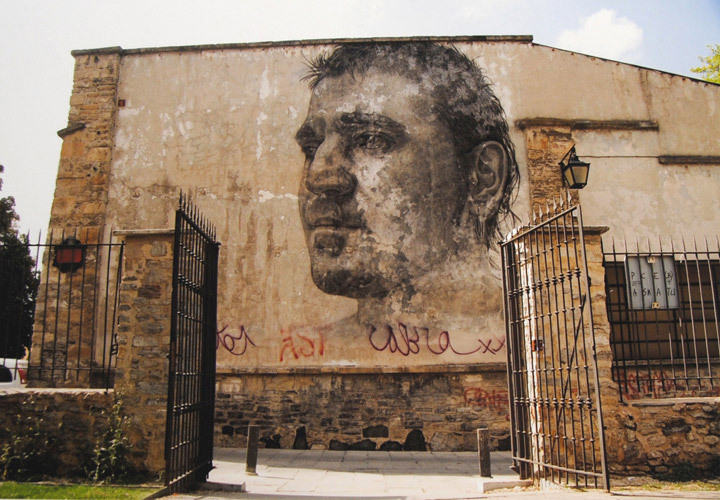 He emphasises the potential of national artists, mostly young artists like Aryz, San/ Daniel Muñoz or Sixeart / Sergio Paredes who have been invited to paint alongside him for RE.SET, a temporary architecture circuit organised in celebration of the tricentennial of Barcelona. 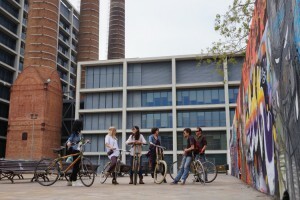 Although the concrete wall that the four artists used “is false, it has been symbolically placed in the middle of the park and focused on a specific issue”, the fact that is has been promoted by the City of Barcelona shows that “people know this reality exists and you have to get better leadership”. Maybe it’s not too late: while Barcelona has “become Disneyland for popular tourism” “to get drunk, or put on Mexican hats on the Ramblas”, street art has endless potential, and the artists are very young: ” If they can now make you marvel at their murals, imagine what they will do when they are 50 years old?”. Now near that age himself, for the first time in his life Jorge Rodriguez-Gerada is creating artwork for galleries. He rejects the idea that, unlike other artists, it’s about “making a small copy of your work from the street. The spray on a canvas seems to absurd”, so he uses quality charcoal and acrylics. But twenty years of street art leaves it’s mark, and so Rodriguez cannot avoid taking a piece of the city in galleries: its fabrics are “shells of very old wall painted by generations of people, each with its history. It is in each viewer to go beyond the visual, to deconstruct Rodriguez-Gerada’s pictures, just as with a city, to discover what’s beneath the surface. Posted in Blog, Jorge Rodriguez Gerada: videos & Interviews, Videos and tagged Interview, jorge rodriguez gerada, street art barcelona, street art mecca, video.